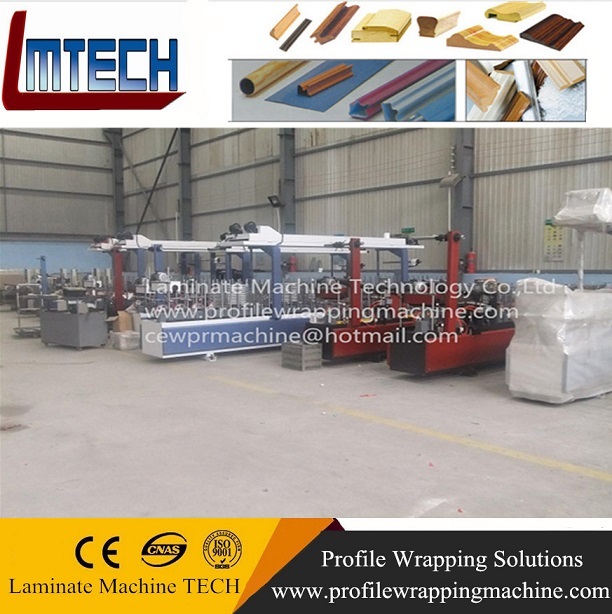 This machine take PUR glue wrapping the real wood, PVC film and melamine paper. 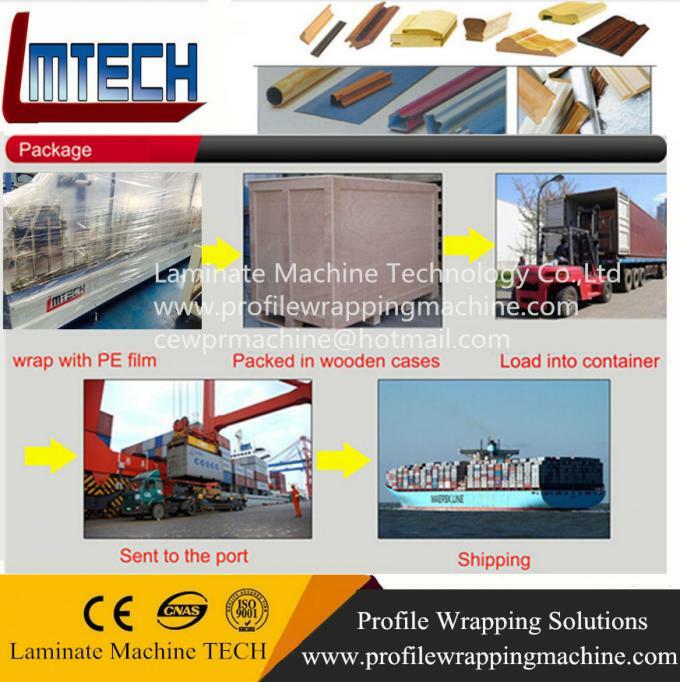 It can wrap various products, such as skirting boards, set lines of door and windows, and railings of stairs. Work fast and perfect adhesive for the material. 1. 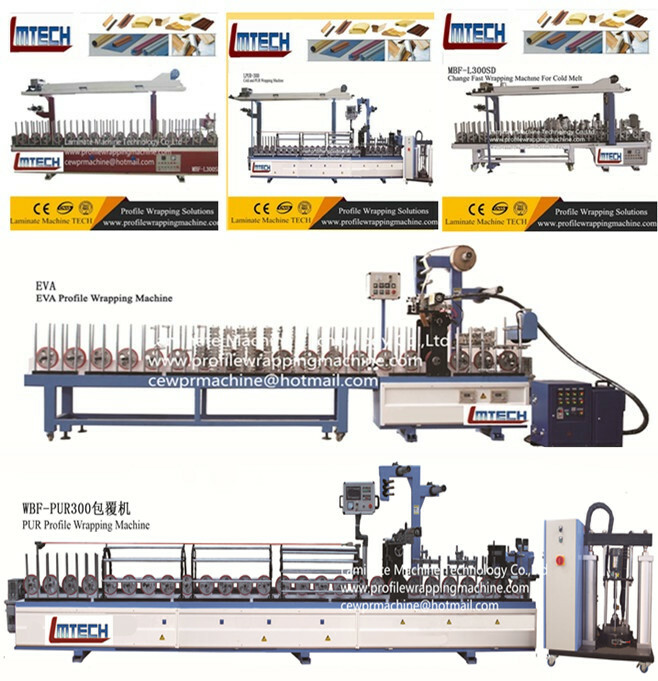 This machine uses high quality steel and complete whole machine body, adopting high precision of the gear transmission. 2. 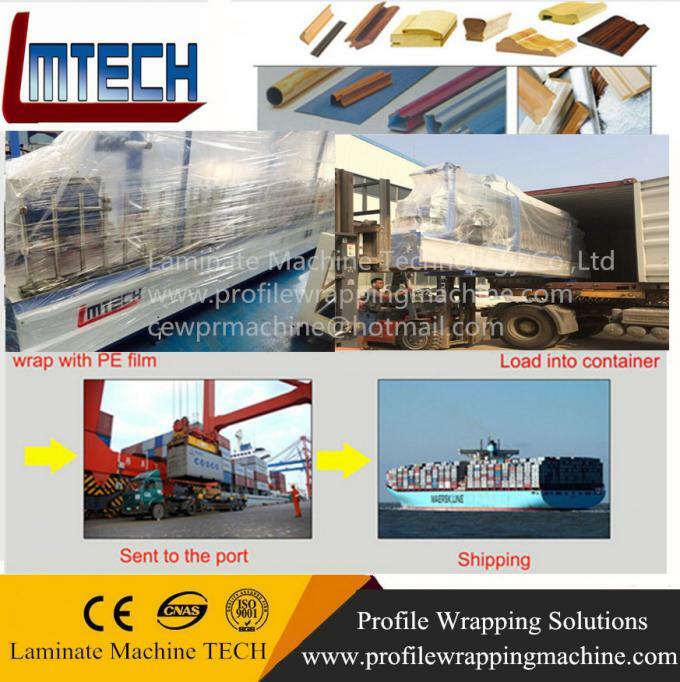 All wheels are silicone rubber and aluminum featuring light weight and high strength, the silicone are good wear-resistance and proof of glue sticky, promise long use life. 4. Adopting high accuracy gear transmission instead of chain transmission. 1)With a 5 gallon PUR hot melt glue system. 2)Glue cutter , can divide and close in middle. 4)Electric brand,PLC: France brand, Schneider,Pneumatic brand: Taiwan Airtac . 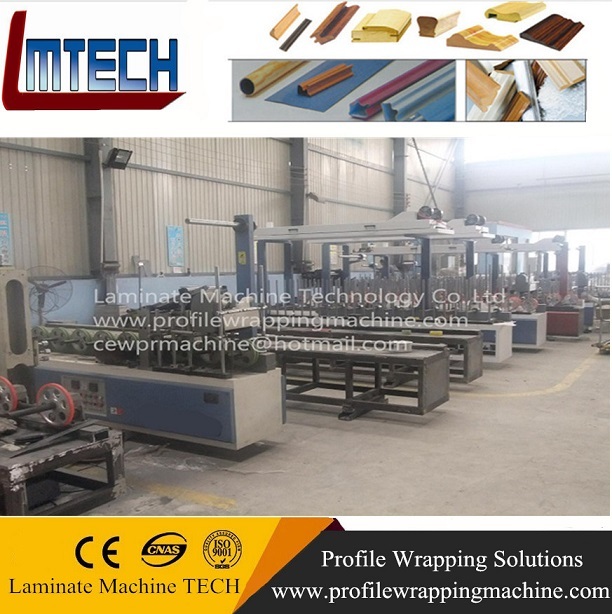 1,Sealing glue cutter ,spread glue on the film ,can control the width of spread glue better, can wrap any profile , it’s easy adjust width , just need to divide from middle to both sides, after finish working need to close and sealing by scotch tape . 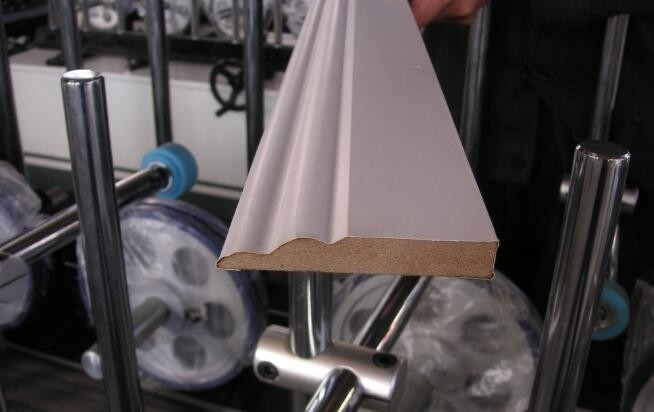 2,The whole knife base is butterfly screw can be adjusted and moved, you can optionally adjust during productive process to alignment the glue mouth with film . 3,The fix glue cutter can be turned by transducer ,if you need to adjust little glue quantity ,you can make glue cutter to be tilt so that make glue quantity more uniform .If the film is more thin ,it can reduce resistance ,to prevent the film broken . 4,If the profile height is different ,you can adjust screw rod. 5,Brake by magnetic powder brake and tension control instrument ,efforts to control stability ,the magnetic powder brake is 2.5kg . 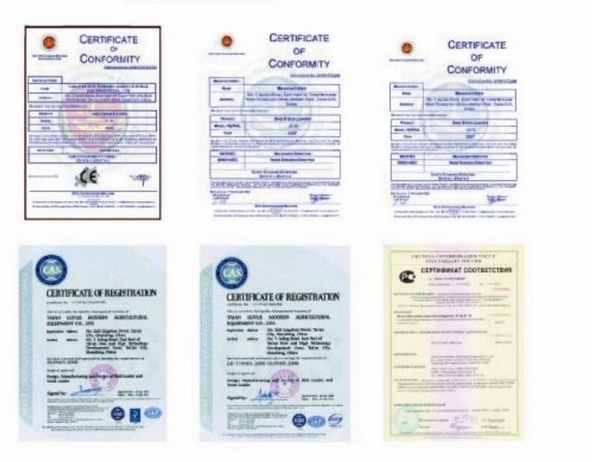 Please kindly contact with for detail information .and let us help you.